We're planning on this for 1.2 or 1.3 -- it's actually a somewhat large piece of work (because we're not well-versed in actual UI-coding), which is why it hasn't happened yet. i think that would be awesome even cooler if the qb template had option to open controls in a separate window. however you can make a button with the hit test patch and there are examples of sliders interfaces here on kineme. im actually making a multi touch circular slider right now i will post later. 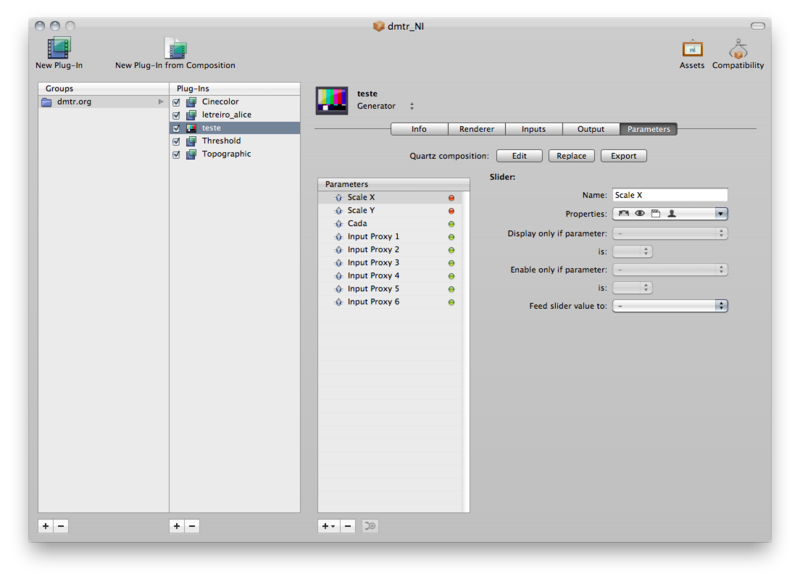 I'm planning on a few different options -- a sheet (like on the viewer window in QC), a drawer, a separate panel (like the Inspector panel in QC). Gotta say.... the HUD is a favorite. Whatever happened to this one C-dizzle (this fella is a one man army.. I seem to remember this bandied about though)? One of the best of all looks! In a similar way, I really like the new Quicktime X style. I love how the title bar and controls recesses like that. My hat is off to whoever came up with that spin. It's wonderful to see a new name chime in with some Quartz Builder suggestions. This is one of the most amazing technologies that has ever been implemented for OS X, in my opinion. I know that might sound wildly hyperbolic, especially given the source, but it's so true when you consider what it's doing; taking something like Quartz Composer, that's a solid, easy to use, intuitive, nodal based programming environment - almost like a high level abstraction of objective programming itself - and then adding a high level Develop Tool for it! Not only that, it's loading patches and plugins internally, making it's own runtime, and turning the qtz's into executables! I hope we do end up seeing even a most basic take on published input implementation, even if it's lacking in choices. Something basically exactly like a floating Patch Inspector would be the ideal... that way you could launch full screen in one screen, and control the app from another, or watch your app in just one screen, and have your Patch Inspector thing float on top. That, and a multisampling option in the Viewer would pretty much make it do just about anything anyone could toss at it for the duration of SL. Nope (as far as parameter view). How does automation=hassle though? I understand what you mean about it being easy to work IB, but that doesn't necessarily extend to the rest of the stuff that QB does... and you can't go 50/50. I wanna go 50/50 ... but that's called an Xcode QCApplication template maybe. Thanks for making me realize what i actually need ! So QB is great I love it. Next week I will actually have a use for that is being able to project things from school labs. They do not let us add things to the library on campus rrr. So seeing I need to do something next week. Im not sure about the QB update schedule but if someone could help with loading a plugin inside a bundle I will love you. I am trying this..
Im not hip to the un offical thing where do I get the class files to do un official things like load a kineme plugin. I got to get an adapter for my laptop to go to vga and well i need the special apple one rrr. I know someone out there knows how to do this.. This sounds like a great feature and is definitely something I would use!